Boeing&apos;s version of the DARPA XS-1 space plane. Artist&apos;s concept by Boeing. To infinity and beyondCutting satellite launch costs is precisely the mission of a new project underway at DARPA, the U.S. Defense Advanced Research Projects Agency. Last year, DARPA initiated a project it calls "XS-1." Through it, DARPA aims to design and build a "space plane" that can launch from the ground like the space shuttle, fly to the very edge of space, then lob satellites the rest of the way into orbit before returning to land back on Earth like an airplane. 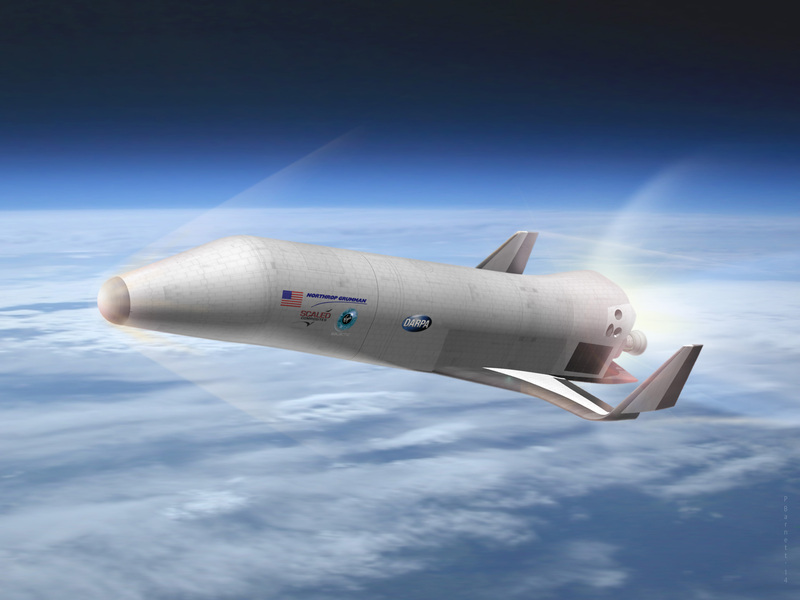 If all goes as planned, the XS-1 space plane should make it possible to put small satellites (1.5 to 2.5 tons) into orbit at a cost of about $5 million apiece. That&apos;s a 92% cost savings on SpaceX&apos;s list price for a basic Falcon 9 rocket launch, and as much as a 99% reduction in the cost of a ULA launch. Northrop Grumman&apos;s competing version of XS-1. Artist&apos;s conception by Northrop Grumman. What we didn&apos;t know was what the XS-1 project meant to these companies, financially. (And as investors, that&apos;s kind of important to us.) But now we&apos;re starting to get some insight into this aspect of XS-1, as well. Dollars and cents (but really just dollars)Last month, in a little-noticed line item in the U.S. Department of Defense&apos;s daily briefing on contract awards, the Pentagon awarded Boeing a $6.6 million DARPA contract to work on Phase 1B of XS-1. Boeing was tasked with "substantiating identified core component technologies, mitigating risk, developing a Technology Maturation Plan (TMP), and performing several demonstration tasks" related to XS-1. The Pentagon also noted that, with the addition of these funds, Boeing&apos;s total funding on the project has now reached $16.6 million. Earlier this month, we learned additional details on XS-1 when Defense Update reported that, in fact, $20 million in new funds was awarded to the three teams working on XS-1. This implies that the Northrop Grumman and Masten Space teams also received $6.6 million awards, similar to Boeing&apos;s. And while DARPA hasn&apos;t confirmed this, if we assume that each team was funded in equal amounts from the get-go, then the total value of XS-1 contracts awarded to date is now probably approaching $50 million (Boeing&apos;s confirmed $16.6 million, times three). So, $50 million. Is that a lot?Not in the context of a $95 billion-annual-revenue behemoth like Boeing, it isn&apos;t. And S&P Capital IQ says Northrop did only $24 billion in business last year. Relative to those sums, "50 million" seems a pretty small number. But to most Americans, $50 million is still a big number. At this early stage in XS-1&apos;s development, it suggests a pretty significant investment that DARPA is making in the project, and a serious intention to invest the money needed to drive the cost of satellite space launches down. Look at the math this way: Cutting the cost of a single space launch by 92% or 99% is certainly a good thing. But if we flip the equation around, an even better thing might be to consider that, for the same money we spend to put one satellite in orbit today ($400 million), a working XS-1 space plane could conceivably put 80satellites into orbit. Times a 2.5-ton payload, that&apos;s as much as 200 tons of cargo. It&apos;s nearly half the mass of the International Space Station, potentially put into orbit for the cost of lifting just one satellite. And it tells us that,if XS-1 gets off the ground, then the business of space exploration is going to seriously boom in the future. More rockets, more cargo, more satellites, more space stations -- maybe even more astronauts? It&apos;s a very exciting time to be a space investor, and we&apos;ve got DARPA to thank for it. And don&apos;t forget the underdog bidding on DARPA&apos;s project.If it wins the contract, XS-1 could put Masten on the map. Artist&apos;s conception of XS-1 at liftoff by Masten Space Systems. The article To Infinity and Beyond: DARPA Adds Funds for New Space Plane originally appeared on Fool.com. Rich Smithdoes not own shares of, nor is he short, any company named above. You can find him onMotley Fool CAPS, publicly pontificating under the handleTMFDitty, where he&apos;s currently ranked No. 329 out of more than 75,000 rated members.The Motley Fool has no position in any of the stocks mentioned. Try any of our Foolish newsletter services free for 30 days. We Fools may not all hold the same opinions, but we all believe that considering a diverse range of insights makes us better investors. The Motley Fool has a disclosure policy.